Newly elected Democratic Congressmember Rashida Tlaib of Michigan made headlines last week for declaring, “We’re going to go in there, and we’re going to impeach the motherf***er,” in reference to President Donald Trump. Newly elected Democratic Congressmember Rashida Tlaib of Michigan made headlines last week for declaring, “We’re going to go in there, and we’re going to impeach the motherf***er,” in reference to President Donald Trump. Tlaib made the comment at a Washington, D.C., bar, days after she made history last week when she and Ilhan Omar of Minnesota became the first Muslim women sworn in to Congress. Tlaib is part of the most diverse and most female class of representatives in U.S. history. 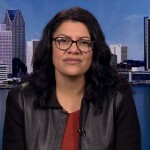 Rashida Tlaib is interviewed from Detroit, Michigan. A group of New York Police Department officers are challenging what they call a racially charged policy of quotas for arrests and summonses. Known as the ”NYPD 12,” they risked their reputations and livelihoods to confront their superiors, fight illegal quotas and demand a more just police force. Democracy Now! looks at a film following their story called “Crime + Punishment.” It has just been shortlisted for an Academy Award for Best Documentary. Stephen Maing is the film’s director and producer, and Lieutenant Edwin Raymond is the lead plaintiff in a lawsuit filed by the NYPD 12.